BIG NEWS! The Sekrit Project is HERE!!! I find it fitting that this is my 112th blog post of the year, since we are leaving 2011 behind and going into 2012. As with everything else; it is all connected. I know that 2011 was a tough year for many people--it wasn't a breeze for me either. But as I look back on it, I mostly see the positive. I am, when it comes down to it, a fortunate woman, blessed with friends, and home, and cats...and with you, my readers. Thank you for sharing 2011 with me. I hope you'll do the same in 2012. So what did I accomplish in 2011? On the writing front, I wrote another book for Llewellyn (#6, the Everyday Witch Book of Rituals, which will out around October of 2012), along with many articles for my ongoing column in the Witches & Pagans Magazine and a bunch of Llewellyn annuals and almanacs. I finished one novel, the foodie romance Reinventing Ruby, and worked on a number of novels that never saw it to the light of day for one reason or another. (For those of you who don't write, the path is never as smooth as it looks like from the outside, believe me.) I finally listened to the requests of my readers who said, "We don't want to wait any longer for your fiction," and epubbed my first novel, Witch Ever Way You Can (with much help from my long-suffering friend and web-mistress, Robin Wright). I spent the year getting to know my agent, the fabulous Elaine Spencer of The Knight Agency, and together, we expect great things in 2012. I finally got to meet Elaine in person at RWA NYC in June, one of four writing-related trips I took during the year. (For someone who doesn't travel much, that's A LOT.) RWA was amazing, as was my trip to Salem in April for the New England Chapter RWA conference, where I got to meet one of my favorite authors, Lani Diane Rich. Both journeys also allowed me to meet up with a bunch of Betties, a group of women who first connected on Lani's blog and formed friendships whose depth has to be seen to be believed. (*Waves to the Betties*)My final trip was to nearby Albany with writer pal Nancy Holzner, where we had a lot of fun despite a less-than-successful event. Of course, the first trip of the year was both the best and the worst: my journey to California in February, to bid my final farewells to my beloved Germambie (my maternal grandmother), but also to be together with both my sisters and my parents. That bittersweet time was followed by my visit to Pantheacon in San Jose, where I was much healed and comforted by the presence not only of my step-daughter Jenn (who lives there now), but also time spent with my adored Llewellyn editor Elysia Gallo, and many of my fans. As I said; the blessings far outweight the trials. On the homefront, I spent much of the year doing a much-needed clearing and cleansing of my house; throwing away the old and unnecessary, clearing away clutter, and letting go of things that no longer worked for me. I can now see the floor of my barn, my entrance door is painted red, and the upstairs closets no longer hold boxes of things I moved in with ten years ago and never used. It feels good. The five cats are all doing well, including Samhain, who is, in theory, dying of chronic renal failure, but who (thankfully!) hasn't seemed to realize it yet. I hope to have at least another year before she does. Two would be good. Three, even better. I can't even begin to count the blessings of my life: a loving family, great friends, the best writing partner on the planet (yes, Lisa DiDio, I'm looking at you) as well as many wonderful writing pals, an agent, five cats, one very old but still-standing house, and a job I love most days. Don't get me wrong--there are plenty of things about my life that aren't perfect (you don't even want to know how long it has been since I had a relationship, or all the fun physical crap I get to deal with), but compared to people who don't have jobs, or a roof over their heads, or food on the table...frankly, I feel pretty lucky. And then there is you. The folks who come here and read my ramblings. Who take the time to leave a comment, or go out and buy my books, or just show up. I thank you for this, and hope that, in the year to come, we can continue our travels together. Wishing you a happy New Year, and (as my favorite author, Jennifer Crusie likes to say) "Nothing but good times ahead." So--how were your holidays? Did Santa (or someone else) bring you something nice? My friends are all fabulous gift-givers too (yes, there are usually a lot of books, wine, and chocolate there too...although not so much jewelry). But the best gifts I got this year came from the hands and the hearts of two of the folks I'm closest to. My pal Terry (who had the nerve to move from Oneonta to Connecticut a number of years ago) came to visit with her hubby on Thanksgiving, and brought me this beautiful shawl she'd been working on since LAST Thanksgiving. And only partially because I apparently picked the hardest pattern on the face of the earth. hey--I'm not a knitter; what do I know? Isn't it gorgeous? Yes, that's a mixed peacock-colored silk. It is as amazing and delicate as it looks, but also surprisingly warm! No doubt from all the love that went into making it. And somehow magically put it on a wine glass! Go ahead, drink out of those, I dare you! My point is, well, LOOK at the trouble my friends went to, just to give me gifts that they knew I would like beyond anything they could find in the store. My friends ROCK. Just sayin'. Did someone give you the perfect gift this holiday season, or go out of his or her way to do something nice? I'd love to hear about it! For all of those who requested a Nook version of my paranormal romance ebook, WITCH EVER WAY YOU CAN--here it is! Be sure to post a review once you've read it, and then come back here and tell me you've done it, so I can enter you in the contest. Contest ends at the end of December, though, so you'd better read fast! Thanks again for all your enthusiastic support of this book--and me. It really means a lot. Last night was the Blue Moon Circle yearly Yule Dinner Party--a time when we gather together with family and friends to celebrate the Winter Solstice. We don't do ritual (since not everyone who comes to this particular event is a Pagan). Instead, we just enjoy being together, exchanging gifts, playing games, and eating (a lot). Since we don't get to see each other as much as we used to, just being together is celebration enough. Well, and there was cake. LOTS of cake. There's great entertainment (that's Sophia and Shaylee putting on a song and dance number). Everyone chipped in on a Criket Cake gizmo that Robin REALLY wanted, and she was so overwhelmed with happiness when she opened the box, she burst into tears. But the best part was just sitting around the dinner table together (in the dining room that is normally my writing area, in case you couldn't tell), with the group Yule log burning, and smiles on every face. The Winter Solstice celebrates the return of the light, as the days begin to slowly get longer and brighter from that point onward. For me, I feel blessed to have the light of friendship in my life, no matter what time of year it is. I hope that you get to spend time this season with the ones you love. Happy holidays from me, the kitties, and Blue Moon Circle. I have some very cool news about the next book (#6, in case anyone is counting) from Llewellyn. You may remember me mentioning it some time ago, when it still had the working title of 50 Rituals for the Everyday Witch. Well, as often happens in publishing, when the theoretically-finished manuscript got sent to my acquisitions editor, the fabulous Elysia Gallo, Things Changed. Most notably, she looked at the manuscript and said, "Um, dude, this is WAY too long." So it was decided to cut the entire last section--12 rituals for everyday use--leaving us with 38 rituals that covered New Moons, Full Moons, Sabbats, and special occasions (like handfastings, Wiccanings, and the like). And the need to come up with a new title, since "38 Rituals for the Everyday Witch" just sounded lame. will be coming out in October of 2012 (probably--these things can change too). Yay! Because Elysia and I thought it was a pity not to do something with those other 12 rituals. 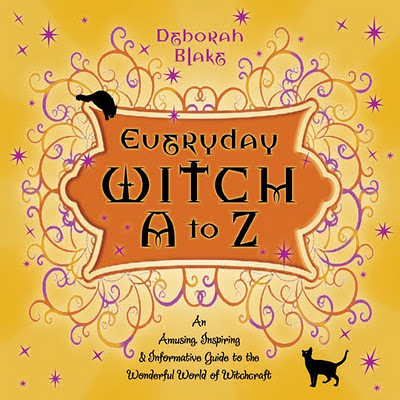 So we're doing something new, and putting them out as a mini-ebook called A Witch's Dozen. I'm not sure when this will happen; probably sometime before the main book comes out. I'll let you know when I hear more. But isn't it COOL???? *happy author dance* Is anyone else as excited about this as I am? And here, with no further ado, is your Feline Friday pic--this is little Samhain, snuggling under the covers in her room upstairs (which is colder than the rest of the house). Hapy Friday, and have a wonderful weekend! I hope you're all having a pleasant (and not too stressful) holiday season. To be honest, I find this time of year a bit stressful myself, what with managing a cooperative shop with 50 artists [really--have you ever tried to make 50 artists all do what they're supposed to do, when they're supposed to do it? Ha! I love them all, but it is like trying to herd cats], making jewelry, working on a secret contract with Llewellyn [what? I haven't mentioned that before? you're sure? okay--tune in tomorrow...or maybe later today, depending on how frazzled the 50 artists make me], putting out the ebook of my first paranormal romance, prepping for Blue Moon Circle's big yearly Yule Dinner party [10 adults, 5 kids, lots of fun--that's this Saturday night...help! ], and, of course, putting up the new Etsy shop with my jewelry. I'll be adding a few pieces of jewelry to my Etsy store over the next couple of days. Come take a look, and spread the word, pretty please. http://www.etsy.com/shop/deborahblake And just for those who read my blog (shhhhh, don't tell everyone else), a special giveaway: if you order a necklace from the etsy store before Monday (the last day I can guarantee it will get there before Christmas), I will throw in a signed book (any of my Llewellyn books, your choice) for FREE. You decide if the book is for you or a gift (tee hee). I won't tell if you decide to keep it. Just leave me a note on the etsy site when you purchase the jewelry, telling me that you saw this message here, and which book you want. If you want it personalized, tell me that, too! Speaking of books, if you want a signed book for a friend for the holidays, I still haven't figured out how to add that to my website, but you can email me at magicmysticminerva at yahoo to tell me which one you want, whether you want it sent to you or to a friend, and how you want it dedicated. We can use the same email address to do a payment through Paypal. But do it by Monday, please, so I can get it in the mail right away. Okay--I'm done. I appreciate your patience. You may now return to your regularly scheduled program. Thank you all for all your support! It means a lot. How do you make an author happy? Well, you can buy their books of course..
Of course, it would also make me pretty happy if you buy a copy for yourself or a friend. But I know a lot of you are waiting on the Nook version...which has now been delayed by my pal Robin's computer getting a virus. Considering we both have colds, that adds up to three viruses too many! Hope you're all staying healthy and warm. And as always, thanks for all your support! It really does make this author very, very happy. For those who asked, the Nook version will be coming out soon--my poor webmistress/book midwife Robin came down with a cold, so it is taking a bit longer than we'd planned. I'll let you know when we get it up on B&N and another spot we're looking at. Also, for the folks who said they didn't have ereaders (ironically, neither do I! ), if you go to Amazon's Kindle site, you can download free apps to read Kindle books on your computer, tablet, or even your phone. (And maybe you'll get a Kindle or a Nook for Christmas...) Don't forget that you can give ebooks as gifts, too... (hint, hint, hint). I haven't forgotten I said I was going to do a giveaway, either. I plan to take all the names of those who said they bought the book or spread the word (both here and on FB) and put them in a hat. Just haven't gotten to it yet...maybe later today. In the meanwhile, I popped over to the Chicklit Writers of America blog and posted a review of one of the top 10 favorite books I read this year, Tawna Fenske's debut novel, MAKING WAVES. If you want to run over and see what I had to say (and maybe leave a comment so I don't look like a friendless loser...) that would be really nice! Once upon a time, there was a book. It was called Witch Ever Way You Can, and it was the first novel I sent out into the world. My first child, if you will. Witch Ever Way You Can spent about two years being submitted to agents and about a year on the RWA chapters contest circuit. It got a great response: agents loved it, editors loved it, my critique partners and first readers loved it, and it garnered all sorts of finals and wins in contests, including the much-sought-after EMILY "Best of the Best" Award. Author Candace Havens (then just someone I admired mightily, now a friend and colleague) even gave me first prize in a contest she was judging and recommended me to her (and now my) agent Elaine Spencer because of it. Eventually, I wrote another couple of books, including Pentacles and Pentimentos which got me signed with Elaine and is currently out on submission. But I never forgot about my first baby. So when Candace and I were talking a couple of months ago about how long it takes to get a publishing contract these days, and how people kept asking me, "When am I going to be able to read one of your novels?!" she had this suggestion: why not epublish Witch Ever Way You Can? I talked to a couple of author friends who had epubbed some of their backlist (older books they'd gotten the rights back on) or even new novels they couldn't find a home for with a conventional publisher. They said, "Go for it!" And I talked to Elaine (because you always run important decisions by your agent), and she said, "Go for it!" And with the help of my uber-savvy friend and webmistress, the brilliant Robin Wright, I did. Ta da! Witch Ever Way You Can is now available for your Kindle at Amazon, and will be available soon from B & N and another couple of places. I'll post links as soon as I have them. (The Amazon link is below.) I've priced it fairly low--$2.99--because I wanted to reward all the faithful folks who have asked for a novel for so long. I hope that people will buy it for themselves, as gifts for their friends, and pass the word (pretty please!) to anyone they think might like a paranormal romance told with a humorous voice. It's about a Witch, of course. I'll probably run some kind of giveaway contest soon...just have to come up with something suitable good! In the meanwhile, who is going to be the first to buy it? Maybe you? I've been working on a Sekrit Project for a couple of months now. Things have shifted and changed along the way, but the important elements are all starting to fall into place now, and I hope to be able to share it with you all soon. Can you tell I'm a little excited about this? I have talked a bit about my writing partner, Lisa DiDio. She is, in a word, BRILLIANT. (No, really.) And also a terrific person, who keeps me from imploding on a regular basis, and helps me to be a better writer in the process. She recently signed with the lovely Nephele Tempest, of The Knight Agency (with an assist from me and MY lovely agent, Elaine Spencer, from same) and is currently out on submission with her insanely good YA novels. Lisa just put up her new website and blog, which are very cool. Go check them out at http://www.lisadidio.com/index.php?doc=1 and give her a little love. You're going to want to watch this woman--she's The Next Big Thing. No, really. I plan to talk a little bit later about the Sekrit Project I've been working on...but for now, here is your Feline Friday picture of Magic the Cat, curling up with mama Minerva. Cozy looking, aren't they?